CNN anchor Wolf Blitzer was surprised to see a smiling Stephen Miller via satellite on Thursday when the senior adviser joined him to react to the news that James Mattis is resigning as defense secretary. Media reports say Mattis is resigning in protest, with Trump's surprise decision to pull U.S. troops out of Syria being the last straw. "There's a lot to be happy about," Miller said in defense of his grin, naming the criminal justice reform bill Congress just passed and record low unemployment for starters. Getting to Mattis, Miller insisted that he and the president had "a great relationship." At the same time, Miller seemed to agree that the two men were at odds when it came to how we should behave toward "wealthy countries who are taking advantage of the U.S." Why are we still protecting them? In his resignation letter, Mattis explained he wants the U.S. to treat allies with respect. Some interpreted that excerpt to mean Mattis was criticizing Trump's treatment of countries like France, the United Kingdom, Canada and Germany. The outgoing Pentagon chief also reportedly did not agree with Trump's decision to withdraw U.S. troops from Syria. The president "has a right to a defense secretary who is better aligned with the president," Mattis wrote. Miller found it rich that the same media that is having an "hysterical reaction" to Mattis's resignation were the ones who "cheered our nation into a war in Iraq" that turned out to be "a disaster." Miller went on to assert that the war made the Middle East "more dangerous and more unstable." "Trump was elected to get our foreign policy on the right track again," Miller added. Pulling troops out of Syria is the right call, the senior adviser said, asking, "are we supposed to stay in Syria spilling American blood?" Many people, Republicans included, profoundly disagreed with Trump's tweet that ISIS had been "defeated." 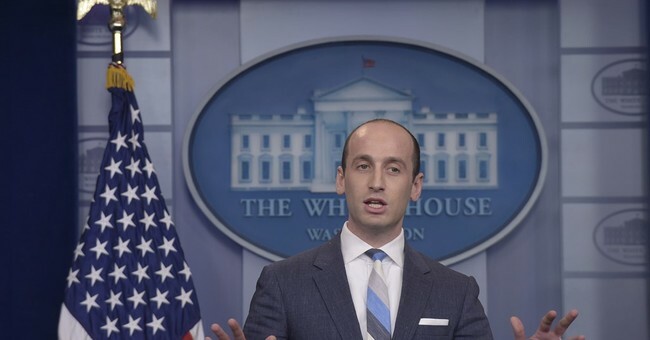 Yet, Miller echoed the president's assertion on CNN and said if the terrorists retrench, "it's going to be up to those countries to defeat their enemy." Blitzer noted how members of Congress have spoken out in droves against Trump's Syria policy, Sen. Marco Rubio (R-FL) being one of the more vocal ones. Trump "welcomes robust views," Miller said. As for Sen. Lindsey Graham (R-SC), who accused Trump of making "an Obama-like mistake," Miller noted how he has often been "wrong about Middle East policy." Miller also seemed to disagree with Blitzer's note that Sen. Graham had said Secretary of State Mike Pompeo was also against the Syria decision. The president "will kill terrorists wherever and whenever he has to, but he's also going to be smart about it," Miller explained. Mattis will be stepping down as defense secretary in February.